Plants get viruses just like humans, but how do we take care of a sick plant? 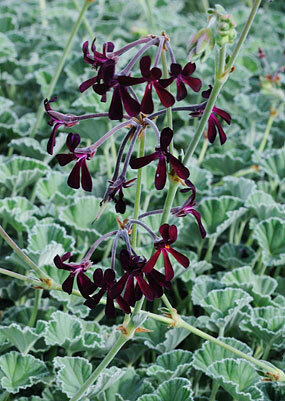 It is difficult, but necessary, for some special plants like Pelargonium sidoides (South African geranium). We only have two in our entire collection! One way to preserve the plants is to use tissue culture techniques to eradicate the virus from the plants. Using this technique, plants are grown under sterile conditions in culture tubes or glass jars on an agar gel. The gel contains everything the plant needs, including nutrient salts, vitamins, hormones and sugar (for energy). Denver Botanic Gardens has a lab that is dedicated to the tissue culture production of difficult to propagate plants. The lab researches and produces for Plant Select® and for Gardens horticulturists. 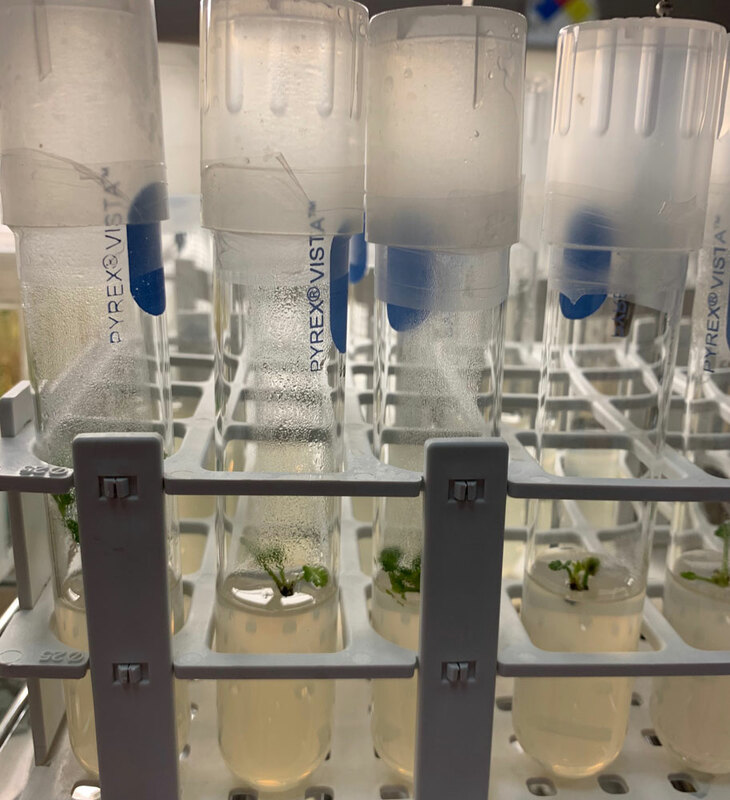 The lab also researches, propagates and distributes rare and endangered plant material for restoration efforts or other botanic gardens for conservation. The method to eradicate the virus in these plants starts with taking shoot tips from the plant. I was able to grow out five plant clones. Under sterile conditions, I harvested the extreme tip of a bud, around 0.1 millimeter, consisting of maybe 10-15 cells that are young and still developing. These cells don't yet have the virus and being clones of the mother plant, this means I can obtain virus-free plants. This is due to every cell in a plant having the capacity to dedifferentiate into a new type of cell given the right conditions, called totipotency (somewhat akin to stem cells). These clean plants can then be mass produced and conserved in our collections, shared with other botanic gardens and potentially re-introduced into the wild. Pelargonium sidoides in a culture tube, growing happily on a sterile, plant nutrient-rich agar gel. This is what tissue culture plants look like. 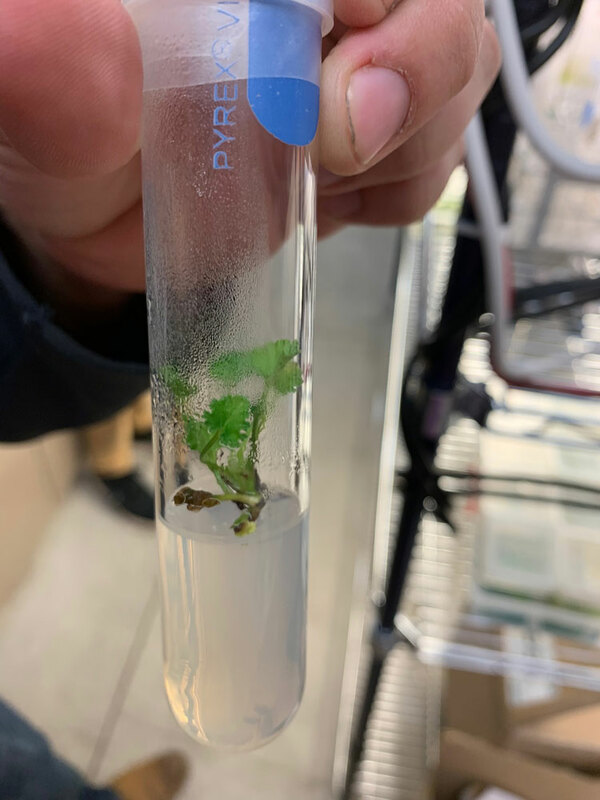 The five shoot tips I was able to collect and grow in tissue culture from one of the two virus infected Pelargoinium sidoides. A healthy flowering Pelargonium sidoides from our greenhouse. It may look different compared to those in tissue culture, but they will all look the same once they grow up since they are all clones. Growing plants in tissue culture is a very different environment compared to our greenhouse.